Welcome to 2016. Tradition dictates that you spend the first few weeks or so reading forecasts for the coming year. I can say with certainty that most of them will be wrong. A smaller number may hit the target. Unfortunately, no one knows which forecasts will fall into which category. For the last 16 years my first letter of the year has also been a forecast issue, and I will continue to go with that tradition – but with one major caveat. I do not base my forecasts on mathematical models or some finely honed methodology, but on my sense of where the economic world stands today and where I think it might likely be in the near future. Actually, I’m going to spend the first few pages demonstrating that the mathematical models used to forecast GDP and all sorts of interesting economic events are basically nonsense. For me, forecasting the year ahead is somewhat like being an explorer who comes to the top of a high new mountain pass along with a group of his friends and looks far out in the distance and sees another mountain pass, shrouded in clouds but offering the promise that it’s possible to continue the journey. It is clear to him that they should all forge ahead to find a way to that next mountain pass, but between his location and his destination lie all manner of unknown geographical features, not to mention the prospect of unfriendly natives who may want to contest their passage. So today, as we crest the mountain pass of a new year, I will look off in the distance and tell you what I see. Let me be clear, though, that I’m not coming back from the future and telling you what it’s like; I am merely hoping to get our general direction right. Some years the path ahead seems remarkably straightforward and clear of obstructions. I can tell you right now that this year the challenges seem particularly fog-shrouded. But what’s an explorer to do but to press ahead? Before we begin, I want to suggest you mark out time in 2016 to attend my Strategic Investment Conference. This year we’ve moved the event to Dallas. The dates are May 24-27. I’m proud to say that SIC probably has more repeat attendees than any conference I know. This fact speaks to the care with which my conference team organizes the event and the quality of our speakers. A side effect is that the bar is raised a little each year. Somehow I have to deliver a better-than-ever program year after year – and somehow we’ve always done it. My goal in designing the agenda is to give you a mixture of old favorites as well as new perspectives. Our confirmed speakers so far (in no particular order) are George Friedman, Mark Yusko, Pippa Malmgren, Charles Gave, Lacy Hunt, Anatole Kaletsky, David Rosenberg, David Zervos, Gary Shilling, Louis Gave, and Neil Howe. We will be confirming several others within the next few weeks. You probably know at least some of those names. If not, you should. Just this initial group is quite a brain trust. For more information, you can visit the SIC 2016 website. Register by Jan. 31 and you’ll save $500 off the walk-up rate. Two notes before we start. At the beginning of the letter I am going to launch a few nukes on the banality of making predictions based on models. That is at least the first half of the letter. If you want only my musings on events to look for in the coming year, skip down about halfway. Second, and VERY IMPORTANT. At least to me. This is the typically the most forwarded letter of the year. 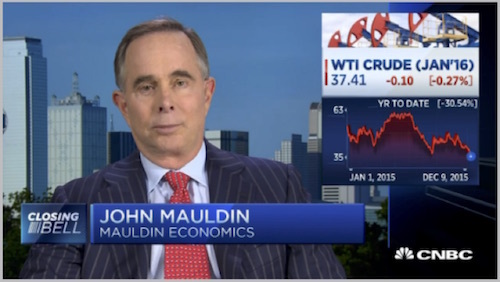 If you are reading me for the first time, this letter is free – you can subscribe at www.mauldineconomics.com by simply entering your email address. And you can get free emails from a brilliant group of writers and analysts who are far smarter than I am, if you choose. The whole team at Mauldin Economics looks forward to serving you. Now, let’s jump in! “What will the stock market do this year?” It seems like a simple question. You might wish for a simple answer to it, and think that people who watch stocks for a living should know that answer. Not so. The evidence shows they are no more accurate than anyone else is. Morgan Housel of The Motley Fool skewered Wall Street’s annual forecasting record in a story last February. He measured the Street’s strategists against what he calls the Blind Forecaster. This mythical person simply assumes the S&P 500 will rise 9% every year, in line with its long-term average. 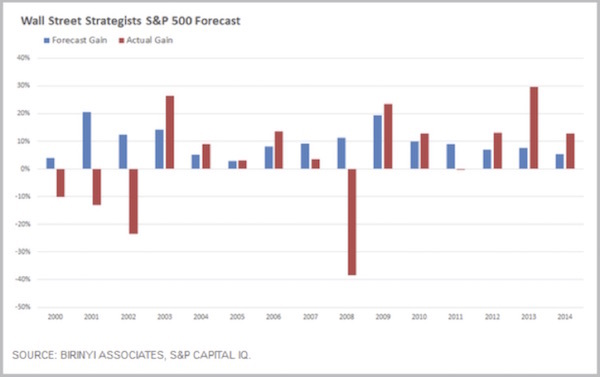 The chart below show’s Wall Street’s consensus S&P 500 forecast versus the actual performance of the S&P 500 for the years 2000–2014. The first thing I noticed is that the experts’ collective wisdom (the blue bars) forecasted 15 consecutive positive years. The forecasts differ only in the magnitude of each year’s expected gain. As we all know (some of us painfully so), such consistent gains didn’t happen. The new century began with three consecutive losing years, then five winning years, and then the 2008 catastrophic loss. The remarkable thing here is that forecasters seemed to pay zero attention to recent experience. Upon finishing a bad year, they forecasted a recovery. Upon finishing a good year, they forecasted more of the same. The only common element is that they always thought the market would go up next year. Housel calculates that the strategists’ forecasts were off by an average 14.7 percentage points per year. His Blind Forecaster, who simply assumed 9% gains every year, was off by an average 14.1 percentage points per year. Thus the Blind Forecaster beat the experts even if you exclude 2008 as an unforeseeable “black swan” year. The first question is easy. I think there’s a burning desire to think of finance as a science like physics or engineering. We want to think it can be measured cleanly, with precision, in ways that make sense. If you think finance is like physics, you assume there are smart people out there who can read the data, crunch the numbers, and tell us exactly where the S&P 500 will be on Dec. 31, just as a physicist can tell us exactly how bright the moon will be on the last day of the year. But finance isn't like physics. Or, to borrow an analogy from investor Dean Williams, it's not like classical physics, which analyzes the world in clean, predictable, measurable ways. It's more like quantum physics, which tells us that – at the particle level – the world works in messy, disorderly ways, and you can't measure anything precisely because the act of measuring something will affect the thing you're trying to measure (Heisenberg's uncertainty principle). The belief that finance is something precise and measurable is why we listen to strategists. And I don't think that will ever go away. Finance is much closer to something like sociology. It's barely a science, and driven by irrational, uninformed, emotional, vengeful, gullible, and hormonal human brains. For the most part, I agree with Morgan. Investors want to believe that certainty is possible, that crunching the right numbers or listening to the right guru will reveal what lies ahead. The idea that markets are inherently messy and disorderly frightens them. It’s much more comforting to think that someone out there has a crystal ball that you just haven’t found yet. I’ll add a twist to Morgan’s answer. I think what many investors really want is a scapegoat. The only thing worse than being wrong is being wrong with no one to blame but yourself. 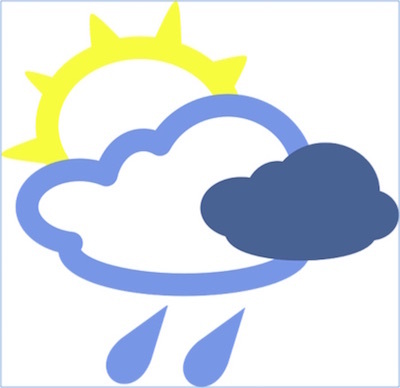 Forecasters keep their jobs despite their manifest cluelessness because they are willing to be the fall guy. Present company excepted, of course. There used to be a saying among portfolio managers: “No one ever gets fired for owning IBM.” It was the bluest blue chip, one that everyone agreed would always bounce back from any weakness. If IBM made you have a bad year, the boss would understand. Compare that to the alternative. How does that discussion turn out if you build your own forecasting model and it delivers dismal results? The story probably ends with you sleeping in the doghouse and/or polishing your resumé. In the short run, hiring a scapegoat, er, forecaster, seems the path of least resistance. That’s why so many people choose it. But in the long run, that path leads you nowhere that you want to go. You will be in fine company as you underperform, but underperform you will. People also look to forecasts that reward their confirmation bias, reinforcing and validating their understandings of markets and investment strategy. Sadly, I must confess that I much prefer to hear a forecast or read analysis that confirms my own biases. Which is one reason I make sure to read the analyses of those who don’t agree with me. I typically ignore – for good reason, as we will see below – forecasts based on mathematical models. I much prefer the assessments of those who analyze the future in terms of trends and general economic forces, giving us their own sense of direction about the interplay of the complex drivers of the economy. But that’s just me. All right, so if forecasting the stock market is harder than it looks, how about forecasting the economy? Surely the Federal Reserve has a good handle on future growth prospects. If that’s what you think, prepare to be disappointed. We can’t say the Fed doesn’t try. In 2007 the Federal Open Market Committee (FOMC) started releasing GDP growth projections four times a year. 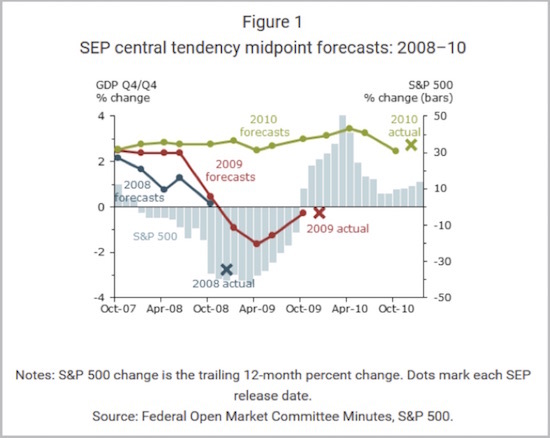 They do this in the same report where we see the much-discussed interest-rate “dot plots.” It is called the “Summary of Economic Projections,” or SEP.
(3) consistently overpredicted the speed of the recovery that started in June 2009. So, it isn’t just Wall Street that wears rose-colored glasses – they are fashionable at the Fed, too. Lansing and Pyle provide helpful charts to illustrate the FOMC’s overconfidence. This first one covers the years 2008–2010. The colored lines show you how the forecast for each year evolved from the time the FOMC members initially made it. Note how they stubbornly held to their 2008 positive growth forecast even as the financial crisis unfolded, then didn’t revise their 2009 forecasts down until 2009 was underway – and then revised them too low. However, they did make a pretty good initial guess for 2010, and they stuck with it. 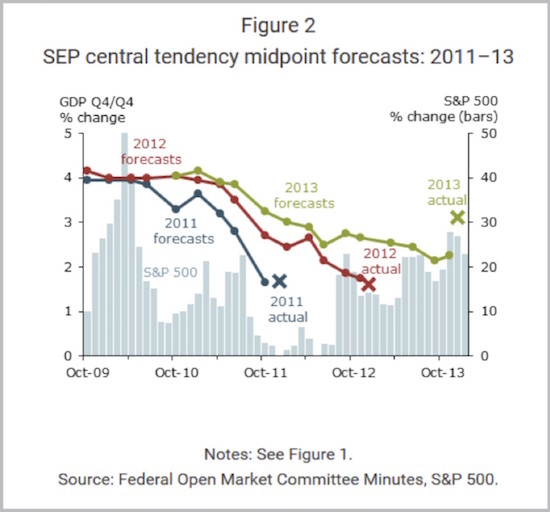 The next chart shows FOMC forecasts for 2011–2013. We see a different picture in this chart. As of October 2009, FOMC members expected 2011 and 2012 would both bring 4% or better GDP growth. Neither year ended anywhere near those targets. Their initial 2013 forecast was near 4% as well. They reduced it as the expected recovery failed to materialize, but as in 2009, they actually guessed too low. One problem here is that GDP itself is a political construction. Forecasting the future is hard enough when you actually understand what you are forecasting. What happens when the yardstick itself keeps changing shape? You get meaningless forecasts. But this doesn’t stop the Fed from trying. If the Fed can’t accurately forecast the economy, can anyone? Surely someone in the federal government has better answers. Read that document, and you will find the CBO readily admitting that its forecasts bear little resemblance to reality. Their main defense, or maybe I should say excuse, is that the executive branch and private forecasters are even worse. The bars compare the degree of error in forecasts by the CBO, the Office of Management and Budget (OMB), and the private Blue Chip economic forecast consensus. A reading of zero would mean the average forecasts matched reality. A negative number would mean they were too pessimistic. A positive number – which is what we see for all three entities – means they were all overly optimistic on GDP growth. So, what we see is that the OMB – whose director is a political appointee – was more optimistic than the Blue Chip consensus, which in turn was more optimistic than the CBO, which was more optimistic than reality. It is also worth noting how the CBO views the future. Their latest economic outlook update, published last August, features this chart. The forecasts for GDP growth, unemployment, inflation, and interest rates all flatline after 2016. 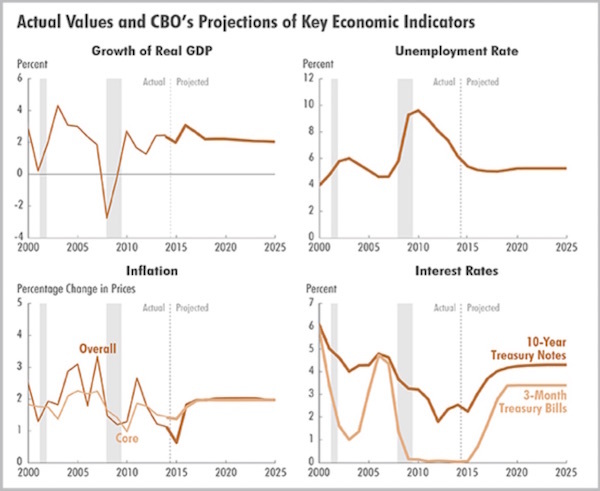 As of now, the CBO’s official position is that the US economy will remain stable with no recession until at least 2025. If you find this particular prognostication hard to believe, you aren’t the only one. Nevertheless, this is what the government agency with the best forecasting record says we should expect. I’ll go out on a limb here and say that the CBO is wrong. I am 100% certain we will have a recession before 2025. We can debate when it will start, what will cause it, and how long it will last, but not whether it will happen. I wrote these next few paragraphs three years ago, but what I said then is still true today. In November of 2008, as stock markets crashed around the world, the Queen of England visited the London School of Economics to open the New Academic Building. While she was there, she listened in on academic lectures. The Queen, who studiously avoids controversy and almost never lets people know what she's actually thinking, finally asked a simple question about the financial crisis: "How come nobody could foresee it?" No one could answer her. If you've suspected all along that economists are useless at the job of forecasting, you would be right. Dozens of studies show that economists are completely incapable of forecasting recessions. But forget forecasting. What's worse is that they fail miserably even at understanding where the economy is today. In one of the broadest studies of whether economists can predict recessions and financial crises, Prakash Loungani of the International Monetary Fund wrote very starkly, "The record of failure to predict recessions is virtually unblemished." He found this to be true not only for official organizations like the IMF, the World Bank, and government agencies but for private forecasters as well. They're all terrible. Loungani concluded that the "inability to predict recessions is a ubiquitous feature of growth forecasts." Most economists were not even able to recognize recessions once they had already started. In plain English, economists don't have a clue about the future. Central banks tell us that they know when to raise or lower rates, when to resort to quantitative easing, when to end the current policies of financial repression, and when to shrink the bloated monetary base. However, given their record at forecasting, how will they know? The Federal Reserve not only failed to predict the recessions of 1990, 2001, and 2007; it also didn't even recognize them after they had already begun. Financial crises frequently happen because central banks cut interest rates too late or hike rates too soon. The central banks tell us their policies are data-dependent, but then they use that data to create models that are patently wrong time and time again. Trusting central bankers now, whether in the US, Europe, or elsewhere, is a dicey wager, given their track record. Unfortunately, the problem is not that economists are simply bad at what they do; it's that they're really, really bad. They're so bad that their performance can’t even be a matter of chance. The reason is that they base their models on flawed economic theories that can only represent at most a pale shadow of the true economy. They assume they can use what are called dynamic equilibrium models to describe and forecast the economy. In order to create such models they have to make assumptions – and when they do, they assume away the real world. It is not so much that the models I am criticizing are useless – they can offer economic insights in limited ways – but they cannot be (successfully) used to predict the economy or stock markets with anything close to certainty. They are simply not complex enough – and they cannot be made complex enough – to accurately describe the nonlinear natural system that is the economy. Such models can at best give you insights into certain conditions that are limited by the assumptions you have to make in order to create the models. If you’re using your models properly, you understand their deep limitations. I freely admit to using models to gather as many insights as I can (especially about relative valuations), but I certainly don’t rely on them to actually predict the future. You should never use a model without understanding in a deep and all-encompassing way that past performance is not indicative of future results. If I were a young and mathematically gifted economist, I think I would explore the use of complexity theory to model the economy, based not on Keynesian nonsense or the hubristic assumption that an economy can ever be in a state of equilibrium (it can’t), but using Claude Shannon’s information theory instead as a better way to demonstrate how economics works in the real world (an idea brilliantly suggested by George Gilder in Knowledge and Power). There is a significant part of me that now feels, or perhaps fears is the better word, that the Fed will embark upon an experiment with negative interest rates in the world’s reserve currency. One of the ideas that I want to explore at my conference this year is what the consequences would be of negative interest rates in the US and how we should deal with them. We will have a number of European financial experts in attendance, and I will pose the question to them. I am more interested in this prospect as a practical matter than as a theoretical one. If you are managing a client’s money in anything that looks like income ETFs or mutual funds, how would you deal with this? There are a number of different types of funds that are actually required to hold their excess assets and cash reserves in short-term Treasurys. Will regulators really make funds hold reserves in assets that force clients into negative returns? Seriously? By this point it should be clear that even the brightest economic and financial minds struggle to make accurate forecasts. Should we ignore them all? No. I think the real problem is timing. I think it is possible to observe events and trends and then to make informed projections about the future. A few people can even do it with reasonable accuracy, at least in their own areas of expertise. The problem lies in correlating what you know is coming with the particular calendar year in which it will occur. For instance, note what I said above. I made a recession forecast within a 10-year period. I feel very confident we will have a recession between 2016 and 2025. I can’t tell you exactly what year it will occur, although I will expose the extent of my hubris by actually trying to narrow that range down in just a few paragraphs. I can readily forecast within a 10-year window because economic trends rarely change overnight. The events that drive national and global economic cycles take time to unfold. Even if we completely ignore present circumstances, we know it would be unprecedented for the US economy to go 10 years without at least a mild recession. I’ll readily admit that some people are pretty good at forecasting short-term market movements. Most of them are professional traders. They’re also the first to tell you that they don’t bet the house on their forecasts. They know how easy it is to be wrong – and how costly. My own talents are at the other end of the scale. I can look out 5–10 years and tell you in broad terms what I think will happen, but the next year is a crapshoot. I make annual forecasts mainly because so many people want to know what I think. If that’s you, please note that I reserve the right to change my mind tomorrow. So with all that as prelude, let’s get on with my 2016 forecast. I talked about it in a CNBC appearance last month. Click on the picture of the old guy for a quick summary; then I’ll give you some additional detail. I don’t know exactly how this happened, but I have become widely known in financial circles as “the Muddle-Through Guy.” I began using the term in 2002, when I was forecasting that we would be lucky to do more than 2% for the entire decade. It turns out I was an optimist – we did only 1.9%. Likewise, I think we will be lucky to average 2% in the US in 2016. In general, recent data has been trending down (with the obvious exception of the employment numbers). I am concerned that the US will be much closer to 1% growth than 2% for 2016. I know plenty of folks who expect the US to go into recession this year. They may be right, but if so that downturn will be due to some kind of external shock. But at a 1% growth rate, which is close to economic stall speed, it wouldn’t take much of an external shock. I can see three real possibilities that we will need to keep an eye on. The first is Europe. Longtime readers know that my base forecast is that the euro survives, but only if the eurozone nations mutualize their national debts. The euro is not an economic currency; it is a political currency. And it will take the political solution of creating a fiscal union to maintain it. Given the level of debt of most of the major members of the eurozone, a fiscal union can occur only if every country – read Germany – agrees to mutualize debts,. Up until recently I believed that you could get a majority of eurozone voters to go along with the pro-euro elite politicians’ extraordinary intentions to actually mutualize debts under the balance sheet of the European Central Bank (or another organization that would be created in the midst of crisis). I now think that a political solution is at serious risk because of the immigration crisis. You can almost feel whatever sense of political unity existed in Europe disintegrating right in front of us. The recent tragic events in France and Germany are exacerbating the problem. I think getting a majority of voters to go along with the idea of giving up national sovereignty over their own budgets (which is what a fiscal union and the mutualization of debt would require) is becoming increasingly unlikely. As more and more people begin to demand that their countries control their own borders, the entire Schengen agreement is in jeopardy. And without that agreement, the next national debt crisis (beyond that of Greece – Italy? France? Spain?) will call into question the unity of Europe. As country after country in Europe begins to close its borders, the flow of refugees will not slow but will actually increase. If you are in a failed state in the Middle East or North Africa and you think the doors to Europe are closing, you’re going to go now rather than wait. The refugees will find ways into Europe through those countries that don’t have the resources to control their borders (think Greece). Europe’s ad hoc approach to border control simply won’t work. It will only serve to demonstrate the true impotence and incompetence of Brussels and EU bureaucracy. And it will provide political fodder to nationalist groups that are beginning to hold sway in a number of major European countries. No matter what you think of economic austerity in Europe, that concept is going to come increasingly under political fire and will be discarded. European borders are becoming less transparent, and Europe is increasingly economically vulnerable. A recession in Europe will cause a recession in a US economy stuck at stall speed. I am flying over China (from Hong Kong) as I write this paragraph. I have just been a speaker at a conference sponsored by Bank of America Merrill Lynch, with some 60 major investment representatives sitting around a large table, for a very wide-open conversation. There were multiple hundreds of billions of dollars of funds represented around that table. Now perhaps it was influenced by two days of significant losses in the Chinese stock market, but the overall mood was decidedly bearish. Only a few people were actually talking hard landing, but the large majority of Chinese growth projections were decidedly lower than government forecasts. Further, there seemed to be general agreement that the renminbi is headed down. I was particularly impressed by the Merrill Lynch Chinese analyst from Shanghai who pointed out that if the wealthiest 3% of Chinese moved just 7% of their money offshore, we would be talking close to $1.5 trillion. Money is literally flying out of China, in a variety of legal and questionable ways. The Chinese government has been manipulating its currency higher for many years. That is now getting ready to change. Andy Xie, a well-regarded China analyst who sat next to me during my presentation, would not rule out a 30–40% devaluation over time. Admittedly, his is one of the more bearish forecasts, but few in the room were arguing that the renminbi would get stronger. Andy in particular was bearish about China over the next two years, though he remains an undaunted China optimist over the longer term. He truly believes China will rule the world within a few decades. In what was a very multicultural room (as you would expect in Hong Kong trading and investment society), it was interesting to watch the crowd’s reaction to Andy’s sentiments. China’s slowing down more than forecasts anticipate – or, God forbid, a hard landing – would definitely deliver a shock to a still-weak US economy. We will have to pay close attention to China this year. While everybody thinks of the Middle East in terms of geopolitics and military conflicts, the economic consequences of low oil prices will have far more problematic effects on the stock markets of the world. We are talking about sovereign wealth funds holding multiple trillions of dollars having to liquidate a portion of their assets in order to maintain their governments. These vehicles were created as the ultimate rainy day fund, and it is raining hard right now. My personal view is that we will see oil in the $20s before we see it back in the $50s. By a kind of perverse logic, the cure for low prices is low prices. It won’t happen overnight, but oil will reverse. In the meantime, low oil prices mean that sovereign wealth funds have to liquidate. But let’s examine that concept for a moment. Many sovereign wealth funds are invested in very long-term and illiquid projects. Rightly so – that is what you should be doing with that sort of money. But that means when you have to liquidate, you sell what you can, not what you want. And that means funds will be selling liquid stocks and bonds. By the hundreds of billions of dollars’ worth. That is a lot of selling pressure, much of it in dollars and much of it in the US. Unfortunately, this will happen just as more people realize the US stock market is priced for a correction. The earnings expectations of many companies are far too optimistic, and they are running out of financial engineering tools to hide it. We have gone much too long without an extended correction. I believe we could see a 15–20% downturn if key companies miss their forecasts. Here is the real question: Can the US have a recession without an inverted yield curve? This is an ongoing debate I am having with several prominent economists. I would say yes. Although we have not seen a recession without an inverted yield curve since World War II, I think we are now in different times, with different underlying conditions, as noted above. Zervos and Rosenberg would argue that the Fed will continue to raise rates until we get the potential for an inverted yield curve, albeit at a lower rate than we have ever seen. I am doubtful that the Fed will raise rates more than two or three times this year. We are going to enter the next recessionary period with interest rates the lowest they have ever been. I defy you to perform an historical analysis that sheds light on future conditions under those circumstances. Which is why I’m concerned about the Fed giving us negative interest rates. I’m actually far more concerned about a real bear market in stocks creating the conditions for a recession. Any of the three potential shocks I listed above could create a bear market and a US recession. Attention must be paid. Jim Grant, who spoke at the same private conference in Hong Kong that I did, said he was worried that the US is already slipping into recession. I am certainly not ready to agree with that analysis, but I am not confident enough to disagree with my friend Doug Kass, who expects that the US will enter recession before the end of the year. My base case at the moment is that we will not, but we will continually teeter on the brink. For all intents and purposes, the result may feel like a recession. Which suggests to me that the data the Fed looks at will keep them from raising rates the four times they currently predict. I still think we will once again see 0% interest rates before we see 2% rates or maybe even 1% rates – depending (I say with a dollop of sarcasm) on the data. Looking beyond China and Europe, Latin America is a wild card. The strain of lower resource demand from China is beginning to show. Argentina has a new president, and Brazil may get rid of its current administration. I think we will see some dramatic swings in Latin American stock, bond, and currency valuations this year. Venezuela is on the edge of collapse. Pulling all the evidence together into a strategy, my own plan is to avoid directional market exposure as much as possible. We should see plenty of volatility, and staying on the right side of it will be very difficult. I think certain targeted technologies will do well – mainly those that enhance productivity. Human workers will keep losing ground to artificial intelligence algorithms – a phenomenon that will continue to spread both vertically and horizontally in 2016. I intend to direct more of my own assets into the private credit opportunities I mentioned two weeks ago. Thank you, by the way, to the many readers who wrote to me about the opportunities you’ve seen. A lot is happening below the radar, with very promising results so far. I’ll share more with you as the year unfolds and legal restrictions permit. Bottom line for 2016: Don’t tie your fortune to a rising market – and I mean any kind of market anywhere on the globe. This is a time to think strategically, stay hedged and diversified, and avoid big directional bets. I think active and hedged management will be the place to be in the coming period. To quote the motto of House Stark in Game of Thrones, winter is coming. In summary, while I understand the argument that Zervos and Rosenberg make about our not entering a recession until there is an inverted yield curve, I do not believe it. In the past it is been easy to predict a recession because every recession since World War II was preceded by an inverted yield curve. With short-term rates artificially low, we no longer have that indicator. The US economy is close to stall speed, and a negative nudge could push us into recession, inverted yield curve or not. The average stock market retreat in a recession is around 40%. If the Fed takes us back to zero rates and, gods forbid, possibly even negative rates, I think we will see the long bond at 2% and the 10-year below 1%. Think Japan. It’s counterintuitive in the extreme, but the world is going to be turned upside down. You are going to get a shot at the lowest mortgage rates of your life. This year? Next year? If such intricate timing makes a difference to you, you need to rethink your portfolio balance. Seriously. Next week I will look at the forecasts that others have made and comment on them. I normally put a personal note here, but the letter is already overly long, and I need to hit the send button to get this to my intrepid editors, who will be working on Sunday. I want to thank my hosts at Bank of America Merrill Lynch in Hong Kong for being most gracious. I believe I learned a great deal more at their conference than whatever small morsels of knowledge I dished out. The dinner conversations were sparkling. I’m looking forward to some biotech startup finding a fix for jet lag, because I do enjoy getting outside the confines of my home and absorbing the knowledge and wisdom of those from other backgrounds. Even with what is a rather sober forecast issue, I remain an unrepentant optimist about the future. You have a great week and even better new year! I look forward to exploring Economicus Terra Incognita together with you. It will be an adventure! Jan. 11, 2016, 10:06 a.m.
Oil will see $25 (if not $20) per barrel before $100, or even $40. Why? Four reasons. Saudi Arabia, Saudi Arabia, Saudi Arabia, and (you guessed it) Saudi Arabia. Experts and Columnists who believe that the Saudi’s are pumping to reduce the West Texas market share are mistaken because they view oil through an economic lens. Adam Smith never wrote about economics. Adam Smith wrote about Political Economics. Saudi Arabia is in an existential struggle with Iran. This is not widely understood or reported in the west. The Saudi’s are now surrounded by Iranian Proxies or Stooges on every side, to wit: the dominant Shiite government in Iran, a Shiite government in Syria, a Shiite government in Lebanon, a Shiite government in Iraq, a Shiite government in Yemen, and Iranian de facto control of the Straits of Hormuz. Only one of these threats existed as a major threat 10 years ago, the Shiite government in Iran. The Shiite threat in Syria was not threatening, except that they typically followed the Iranian lead. With Shiite Hezbollah and the war against Sunni fundamentalists, that calculus has changed in a negative direction for the Saudis. Along those lines the Saudis will do everything they can to hurt Iranian prospects politically, militarily and economically. 1) The production costs for oil. Simple math. Saudi Arabia has a cost basis of about $4-5 per barrel of oil. Iran has a cost basis of about $1-15 per barrel, depending on whom you ask. This production cost difference is meaningless at $100 per barrel, but significant at $20 per barrel. Throw in a measure of dealing with the Iranian government, and western companies will likely tread lightly as they enter the Iranian market. http://www.upi.com/Business_News/Energy-Industry/2015/12/30/Oil-production-costs-low-Iran-says/5491451477347/ reports the Iranian cost at $10 per barrel. http://www.businessinsider.com/iran-oil-costs-1-per-barrel-2015-12?r=UK&IR=T reports the Iranian costs at $1 per barrel. 2) Investments in Oil Infrastructure. Again, simple math. If oil has a lower cost, then even less money if available for investing in infrastructure. Or stated more simple, “The cure for low oil prices, is low oil prices.” Thus the $15 dollar production costs for oil in 2016 becomes $16 dollar in 2017 without infrastructure improvements and capital spending. Saudi Arabia began this phase of the political struggle with Iran in full stride with money reserves for at least two years in the bank. Iran hits this struggle at the economic bottom, with no money in the bank, no good will with production companies, and with reduced infrastructure spending over the last decade. This argument is the same for (a) Russia, (b) Venuzuela, (c) U.S. shale fields and (d) Canadian production that concerns Western economists. To the Saudi’s, everything else is merely collateral damage that both the Saudi’s and President Obama are willing to accept for the time being. 3) OPEC members have historically cheated on their production ability. Saudi Arabia has historically made up the production difference. They did not seem to mind the cheating as long as members stayed within a certain boundary. As of 2014, Saudi Arabia does care. Future OPEC production quotas will likely be based on how much oil you could pump in 2016, when everyone was pumping at their national maximum, not how much a blustering Chavez in Venezuela boasted he could produce – one day. And Saudi Arabia will likely enforce any future production quotas more stringently. 4) Saudi Arabia is teaching the other members that OPEC has one indispensable leader: Saudi Arabia. Members who do not see recognize this fact will likely find themselves on the outside of newly established quotas and newly established cheating enforcement. Given these reasons, the world can expect cheaper oil in 2016, and a OPEC paradigm shift when Saudi Arabia begins to slow their rate of pumping. Fewer cheaters, more severe penalties for cheaters, lower production quotas for some members, lower investments, and lower marginal profits for everyone. Will Iran go along? That’s a question for 2017, but it’s doubtful. Is Saudi Arabia worried about shale oil? Hardly, without the shale oil, they could not have driven the 2015 oil price this low for this long. In fact, they would probably welcome significant shale oil production at $14 per barrel, or $1 less that the Iranian production costs. The US oil fields are the best friends the Saudi’s have in this struggle. Jan. 11, 2016, 8:40 a.m.
Only, repeat only, if the “refugees” perceive Europeans to be weak and noncommittal in the enforcement of their sovereignty. Europe has always faced invasion over centuries past. In the past, the Europeans had the will to defend their country and their children’s future. If they regain their composure and require their governments to act in their citizens’ best interests, Europe can stop the invasion they are now facing. Jan. 11, 2016, 2:25 a.m.
How can economics not work well? I mean you start with some basic ideas like “Individuals act so as to maximize their utility functions (subject to given constraints” and “the value of something is what a willing buyer would pay a willing seller”. What could possibly go wrong? Well, first off no one knows how to write the utility function. Ordinary people can’t even understand the statement, never mind actually trying to perform this analysis. Even if they did know the function and the constraints, no one would know how to solve it for its maximum. Heck, it is not even guaranteed that there is one or is only one maximum. Secondly, the definition of value generally means that we will use outlier values rather than medians or means as inputs to our models because the willing seller is always going to be most willing to sell to the highest bidder.